New Weather Service for PDAs | BlackBerry Blast! 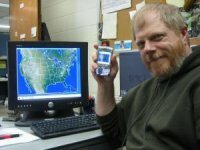 Russ Dengel, a senior information technologist at the University Of Wisconsin-Madison's Space Science and Engineering Center, has created a new PDA-friendly weather Web service that users can use to obtain weather information on demand. Dengel's PDA Animated Weather service, known as PAW, benefits a diverse community, from long-haul truck drivers to firefighters in Puerto Rico to commuters trying to get to work safely on a snowy morning. The free service allows PDA users to access real-time radar and satellite weather images and forecasts whenever and wherever. "It's like a meteorologist's dream," says Dengel, a senior information technologist at UW-Madison's Space Science and Engineering Center, where he has access to numerous products. Dengel frequently updates and expands the service's capabilities to meet the needs of his users. "I want to show people what's possible," Dengel says. PAW users can choose from a multitude of geographic regions and data options, including functions like animation, zoom and roam. Recently, he tailored the service to meet the needs of the fire department in Puerto Rico. Dengel set up a radar loop centered on San Juan and added satellite data showing clouds over the area. The PAW, he discovered, is "a fairly decent unit for first responders." He plans to continue to work with fire fighters in Puerto Rico to help them get the most out of the PAW service. Dengel also accommodated the fire department in Boise, ID by outfitting PAW with region-specific radar products.